Whatever the character trait you are looking for in a new hire, there is one quality above all that must be present in abundance. This quality is more fundamental than self-motivation, has a great impact than candor, and gets better results than efficient org charts. In the world of the Church we see personal discipline as the foundation stone of Christian living. After all, the word "disciple" means "One who is disciplined". In the business world, disciplined thought, action, governance, planning, and disciplined resource management is the key to profit and success. As social sector workers, instead of private sector, profit is not a measure of what we would label "Success". But even so, discipline remains the fundamental characteristic of any great parish, school, diocese, or other Catholic organization. "Mediocre companies rarely display the relentless culture of discipline - disciplined people who engage in disciplined thought and who take disciplined action - that we find in truly great companies. A culture of discipline is not a principle of business; it is a principle of greatness." Collins wants to apply the main principles from his book Good to Great to the world of the non-profit, so he wrote a monograph called Good to Great for the Social Sectors. I draw from this small booklet because it addresses many of the problems faced in the parish. A few years ago a parish ministry leader asked me to be in one of her big events as an Emcee. The event was just not my cup of tea, at all. I did not want to be in it, and so, politely, I told her just that, which should have been enough. A few days later, however, I was greeted with an email saying that, oops! she went ahead and wrote me into their official program and printed off 1,000 of them with my name in there. "So," she said "I guess you're stuck!" I was furious and astonished that someone would do that. In my reply I told her how unprofessional it was to try and paint me in a corner to do something I already made clear I did not want to do. Her reply told me volumes about parish work: "Professional? It's not like we work at Exxon or something! This is a church. You don't have to be professional." 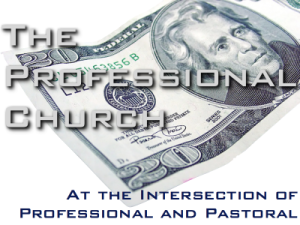 Where is the line between being pastoral and being professional? How much should your local parish reflect the life and culture of a successful business? What practices, if any, should a parish incorporate from the business sector? What is the role of numbers in terms of audiences reached and money budgeted? I recently had lunch with a friend of mine, Ennie Hickman of the Hickman Family and Adore Ministries here in Houston. Besides playing catch up in each other's lives, we spent a lot of the time asking questions and thinking crazy thoughts about what would make ministry- especially youth and young adult ministry- better, more effective, more lasting. This was primarily a conversation about dreaming and, to steal the cliche, "thinking outside of the box." The "box" in this case was parish-based ministries. Why the Box may not be enough. As the priest crisis continues in the U.S. we are seeing nervous bishops doing some extreme things to keep their churches in order, sometimes making very unpopular decisions, like closing and consolidating churches. With fewer priests to go around, the Church is tasking deacons to take over more priestly functions. Rising also in this environment is lay ministry, people from the pews getting theology degrees and pastoral training in order fill in the gaps. There are an explosion of national organizations that are there to assist weary pastors in their work of evangelization and catechesis.